I have always had a terrible weakness for American style carrot cake – the soft, moist slices, filled with spices and topped with thick cream cheese icing. However when it came to the subject of nuts – as far as I was concerned they had no business being in my carrot cake. That was until now. It all started with my new French cook book, Des Recettes du Potager. On first glance this little green book is filled with savoury recipes for garden vegetables, but on closer inspection I found 1 or 2 sweet treats nestled inside. One of these was le carrot cake, made with ground toasted hazelnuts! The French are famous for knowing a thing or two about baking, so why oh why did I have so much drama with this new recipe??? The first time I made this cake I followed the recipe to a T, and from an outsiders perspective I had triumphed – the cake rose well, had a nice crusty golden outside & soft moist inside. I especially like the small twist of flouring the cake pan with brown sugar (cassonade), which added a sweet caramel effect. But that’s where the joy ended. Taking a bit of this lovely looking cake, my 1st thought was, oh how delicious …., then wait, hold on, what’s that funny aftertaste, a sort of acidity that rests on your tongue, lingering in the background. Another bite confirmed that I was not hallucinating. So it was back to the drawing board, for trail N°2. This time I replaced the ground toasted hazelnuts with almonds & used chestnut flour instead of all-purpose white. The result was better, as the aftertaste was less noticeable, but it was still there, lingering, & I wasn’t happy. You see – drama drama drama drama. AMARETTI These well known Italian almond cookies, get their name from the Italian word ‘amaro’ meaning ‘bitter’ as they are made with bitter almonds & ‘etti’ indicating that they are small. Don’t be scared off, as most of you know, these cookies are anything but bitter, and the ones I make are not small! Though I have to say that the Nona’s out there must have a hidden family secret or simply a magic fairy in the pantry, that allows them to make this recipe perfectly every time. Let’s just say that I was a ‘virgin amaretti maker’ a ‘babe in the kitchen’ and was in serious need of 1. a pair of training wheels 2. a Nona with a black belt in Italian patisserie and 3. to “borrow” that little magic fairy…. As my 1st attempt produced a very sad, poor excuse for amaretti …. they were lifeless and flat, and while the exterior was shiny & crispy, the biggest disappointment was yet to come – as biting into the cookie you were to discover – NOTHING, AIR, VOID, HOLLOW SPACE…. oooh that cannot be good I though. So I went back to the drawing board. After much reading & baking, I came accross Yvonne’s recipe for amaretti’s. For this I have to say ‘chapeau’, my hat goes off to her – so impressed was I with these cookies, that I was inspired to create my own version based on her recipe – omitting the cocoa powder & almond decoration, and using pure almond essence. 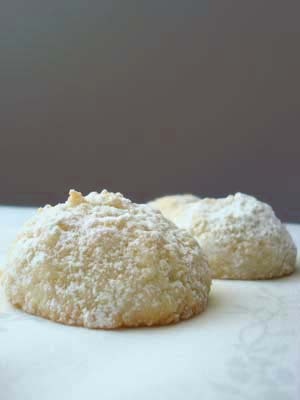 These amaretti cookies are easy to make, have a lovely almond taste and a wonderfully soft centre!